SCT0800 series are replacement of JST SUR Series connectors. 0.8mm pitch wire to board connector,low-profile compact tyle, IDC style without crimp terminal. SUR 0.8mm connector is the world’s first 0.8 mm wire to board connector. This SUR connector is suitable for densely crowded electronic devices. This means that it is flexible to be used as chassis wiring with a maximum amperage of 0.5 amps and as power transmission wiring with a maximum amperage of 0.09 amps. Transmission speed is optimized providing superior signal characteristics. The three-point grip construction connects the connectors in equipment, preventing conduit pull out. This feature provides safe and reliable distribution of wire pressure between three points. It allows firm and rigid grip distribution preventing damage of the wires by vibration and any kind of movement. The connector can be used with the wires of AWG within the range of #32 to #36. This applies to wire diameters as small as 0.127mm to 0.2019mm. Superfine wires such as these can help the routing job. 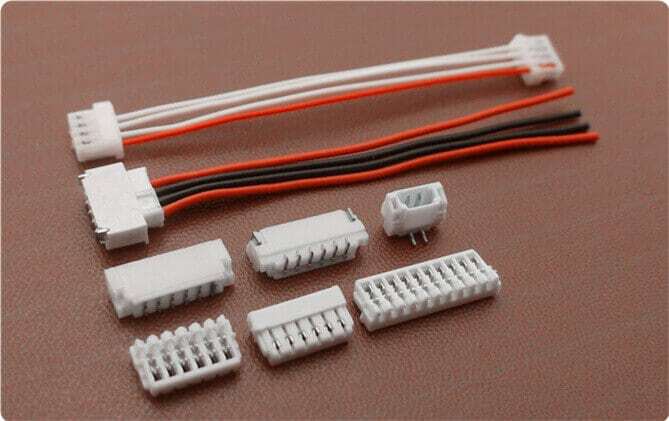 The 0.8mm pitch connector can also be used with conductors with 7 strands thin copper alloy of diameter 0.39mm. The pin header of the connector is wrapped with a thin plastic guide box around it good for preventing cable connection mishaps. Two mount configurations can also be considered such as top and side mount. Around 34% of the space on the PCB can be saved for the side-mount configuration in comparison with other conventional types of connectors. The temperature range for the 0.8mm connector is -25 degrees centigrade to +85 degrees centigrade. This range is based on the rise of temperature with increasing current. Insulation and contact resistance are of 100M omega minimum and 20m omega maximum respectively. 0.8mm pitch serves as the best choice for densely crowded electronics systems for its small, square-edged configuration, ruggedized and shock resistant feature. The 0.8mm Pitch connector can either stand as power contacts, signal contacts or both as power and signal contacts or a signal and grounding contact. The wiring harness interconnects the PCB to various components that send signals and power to other electronic devices. SUR 0.8mm pitch connectors ensure safety, system protection and performance with its bonded metallic conduits and multiple grounding points preventing fire hazards, component damage, overheating and possible electrocution. 0.80mm Pitch Connector finds its advantage in devices such as, Multi-function/printer office machines, gaming electronics, Imaging and digital cameras, security systems, VCRs, PDAs, computer, notebook, speaker, headlight, engine, stereo, LCD, LED lamps, battery, lamp strip, fan, car, headlights, PCB, television.